I made this blanket a while ago. 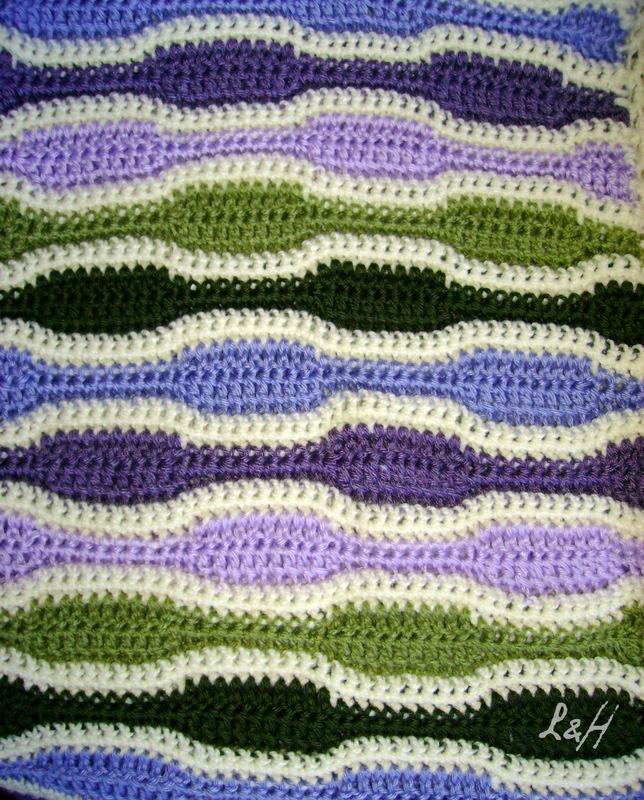 It is made with crocheted waves of different colors. So pretty and so effective! I love it, thank you for sharing the pattern. So you do the first row in the offwhite - then 2 rows in a color, then a row in offwhite, then 2 rows in another color, and so on? Also, do you know which colors you used for the green and purple ones? So pretty. 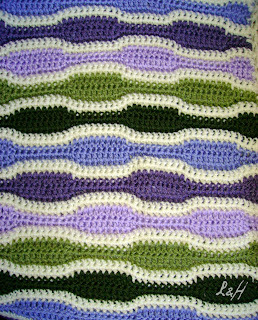 Re: the questions...yes, I started with the sc row in the light color, and then the wave pattern in the other color. Caron Simply Soft in Forest Floor (dark green), Lavender, and Eco purple. Tamm 2000 in moss green. Cisne Rendidora for the off-white. I am sure you can find all the colors in Caron Simply soft. Thank you for your quick response! I am going to try this in January or February. Ordering my yarn now! I too really like Caron Simply Soft. It has such a nice feel to it. Ohhh this is stunning. I will give this a try! It's very beautiful! I will sure try this patern myself. Thank you for sharing. 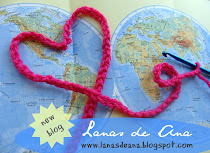 On my blog you can see my "bobbling"project. You might take a look and see if you like it. The blog is in Dutch, but maybe you would like to see the pictures. i love the wave pattern..i am going to make one..but how many skiens of yarn did you use? and how many stiches to begin the blanket? 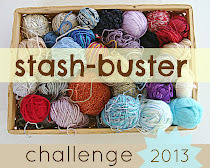 For my blanket, I used one skein for each color, and almost 2 of the cream color. Can´t wait to see your version od this blanket. Cheers. ANA: Vi tu frazada en todos celestes y blancos, y está muy linda. Me gusta que le hayas incorporado la lana matizada. También noté que uniste las ondas con un punto largo. Es muy lindo ese detalle. When doing the repeat rows do you start finish off and start all on the right side? Yes! You "come and go" with one color, therefore you are left with the ends on the same side. Thank you for that pattern. I have been doing shells because that's what my family wanted. I look forward to trying this pattern. So pretty. 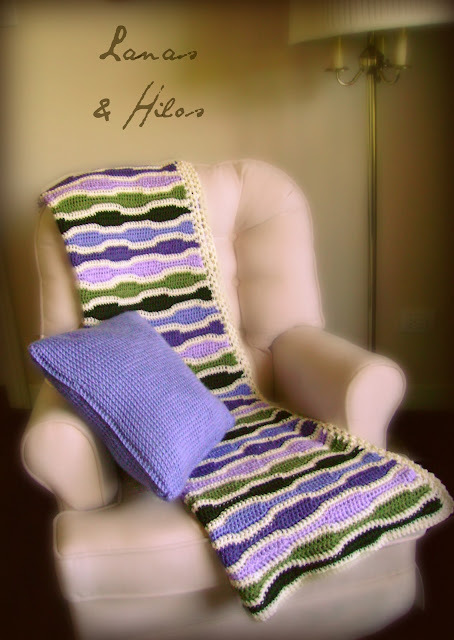 I am doing a very similar afghan, but would love to try your pattern as well!! My question is: what do you do with all the ends? Mine looks like fringe, but I would like to finish off like you did. Do all of the ends needs to be worked in...or did you have a special way of taking care of them? yarn tails are a mess, I know. I try to hide them a bit by crocheting the next row over them. Then, I split the yarn, and do a double knot (this way, the knot is not as big). I hope this helps. I just have a question. After you do the first row of SC, and you go to start the next row, do you skip the first stitch, or chain 3 and then do the DC? Looks as though I'm a little late finding you. Like this wave blanket but when I clicked on the "get pattern" all I get are these comments. Where can I get the pattern? I'd like to try this as a gift for an upcoming Chinese Auction prize. Thanks.